One of the UK’s best-loved novelists, Sir Terry Pratchett, who was renowned for his series of comic fantasy stories, Discworld, has died. He was 66. The author, who had been suffering from early onset Alzheimer’s disease, died at his home Thursday “with his cat sleeping on his bed,” his publishers, Transworld, announced. They said it was with “immeasurable sadness” that they revealed news of his death. PM: Sad to hear of Sir Terry Pratchett's death, his books fired imagination of millions & he fearlessly campaigned for dementia awareness. The author of over 70 books leaves his wife, Lyn, and daughter, Rhianna. Very sad to hear of the death of #terrypratchett. I vastly enjoy his playful, smart #Discworld books. “All who read him know Discworld was his vehicle to satirize this world: he did so brilliantly, with great skill, enormous humor and constant invention,”he added. 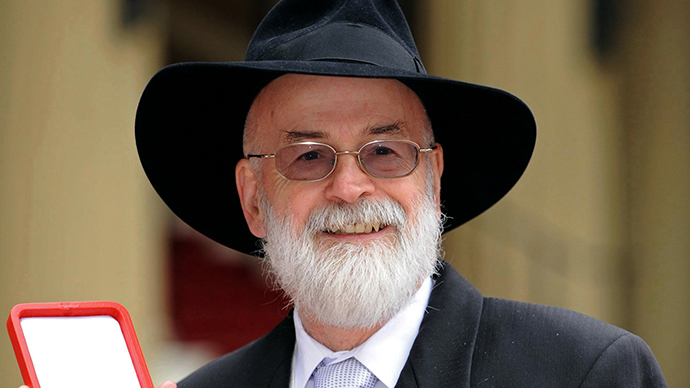 Pratchett’s death was announced on his Twitter account, with references to the Discworld series. Tributes to the author, who continued to write novels in spite of his illness, have flooded social media, with fans and celebrities alike mourning his loss. Crying. Good Omens meant so much to me. I read it while 15 and miserable, my mom read it while sick with cancer. Thank you, #TerryPratchett. Been reading tributes on here to Terry Pratchett. Quite beautiful. Words live on and on.